Our method gives you a fully integrated security and risk management structure across all three levels of operation. From head office, to field and theatre. Identifying pressing needs and overhanging threats by understanding existing procedures, culture, key players, and red flags in every level of the organisation. Establishing an improved security structure that builds upon your existing structure. Tightening gaps, minimising vulnerabilities, repairing communication lines. Integrating security measures across the organisation by enhancing information loops, decision tracks, communication maps and appropriate training. Constantly using stress-testing, monitoring and feedback loops that helps you implement constant improvements and enabling even better decisions. A failure to adequately anticipate and plan for a serious incident can have catastrophic consequences for employees’ health and wellbeing. We work hard to provide the best security environment possible in any given situation, reducing the risk that they will be injured or kidnapped while working in the field. As an employer you have a clear legal duty of care. By providing an integrated security and risk management system you lay the groundwork for a positive outcome in the event of a serious incident. Documenting that you have anticipated and planned for this can prevent lawsuits, damage to client property and reputational damage which can result in loss of donor income. Since every client is different, you get an expert that works in and alongside your organisation in order to build a detailed risk response and exposure profile. 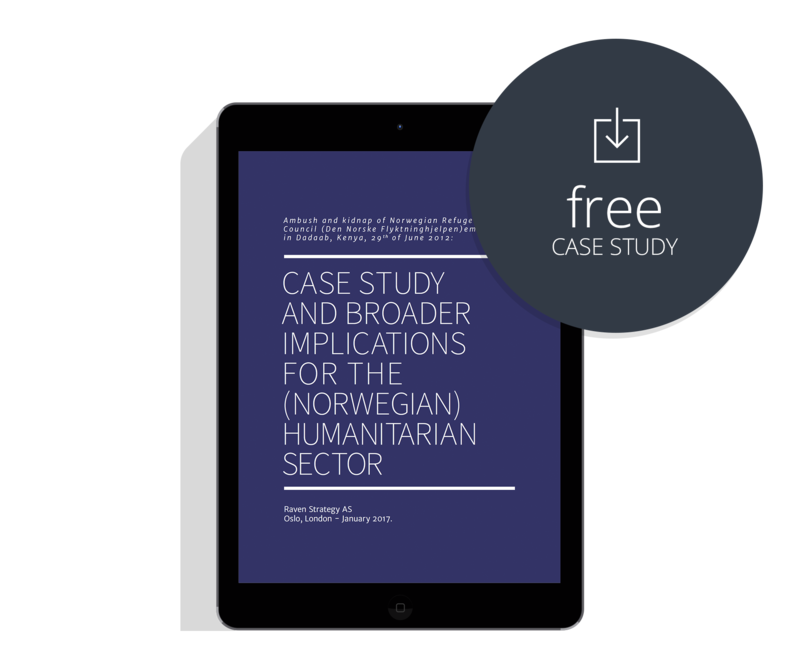 Download our free case study to understand how we assess security structures. Don´t let flawed security structures limit your ability to operate in challenging environments.